Trevose, Pa – Lenox Instrument Company’s extensive line of rugged, high performance sectional, extendable borescopes are modular in design and allow the user to add extender sections to provide long working lengths up to 120 feet (36.6 m). Lenox sectional, extendable borescopes are available in diameters of 23, 35, 45, and 70 mm and deliver uncompromising image resolution to allow identification of flaws as small as 0.0005 in. These extremely versatile instruments speed up inspection time and provide sharp, clear illumination of welds and surface defects, like pitting, corrosion and denting, inside tubing and pipe. Various viewing heads like right angle, bottoming, retrospective, forward oblique, and circumference are available for Lenox sectional, extendable borescopes. The circumference (panoramic) viewing head, which is designed to allow for rapid inspection of tubing or other cylindrical shaped structures, projects forward to view the wall at slanting incidence so a 360° band, several inches wide can be seen at a glance. A centrally located mirror provides a right angle view for more critical examination of the area just scanned by the panoramic view as the borescope is advanced. Lenox sectional, extendable borescopes systems are a viable alternative to more expensive and labor intensive videoscope systems and offer users the advantage of being able to inspect large internal surface areas in less time. 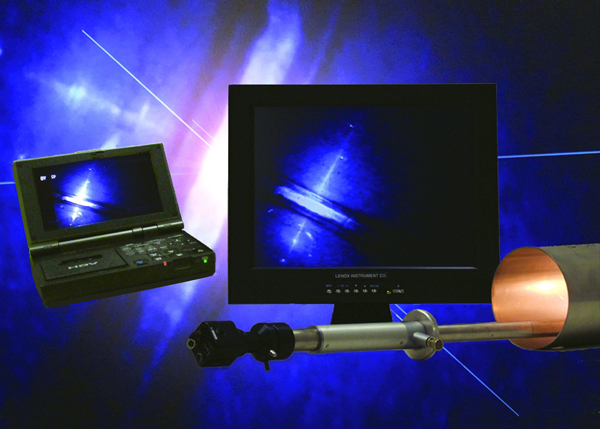 Each Lenox sectional, extendable borescope system is designed, manufactured and serviced in-house by Lenox Instrument Company, and is backed by a two-year warranty.